Kathryn York performs on stage during Pride in the Park on June 24, 2017. 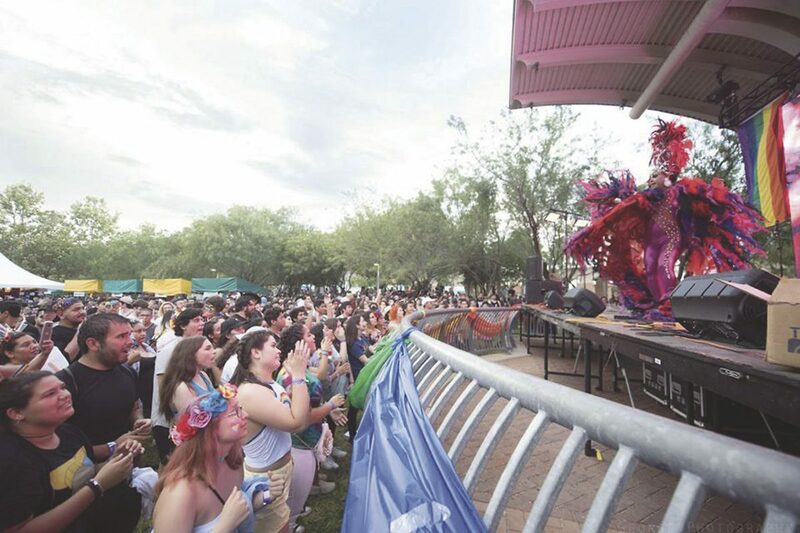 This year’s Pride in the Park arrives at a crucial moment for the Rio Grande Valley’s LBGTQ community. According to the Center for Disease Control, 1 in 4 gay or bisexual Latino men in the area will become HIV positive by 2020. One reason the event began in 2013 was to help bring awareness to the higher rates of HIV cases in the Valley, said Oscar Lopez, a director at the Valley AIDS Council and the coordinator for Pride in the Park, which takes place from 3 to 10 p.m. Saturday at the McAllen Convention Center. The Valley Aids Council and The South Texas Equality Project host the event, which is the region’s largest Pride celebration. Lopez said 5,000 attended last year’s event and more are expected this year, giving the Valley Aids Council a larger audience to educate the LGBTQ community about the area’s high rates of HIV cases. Lopez pointed to the stigma surrounding HIV and economic disadvantages as the biggest contributors to the higher rates in the Valley. A person with HIV who takes their medication, maintains a healthy lifestyle and shows up to their doctor appointments will decrease their chances of passing on the disease, Lopez said. Among the reasons Lopez said people don’t get tested locally are because they don’t want people to know they are HIV positive or don’t want people to think they are gay. That information comes from a survey the Valley Aids Council conducted in 2012, one year before the start of the annual Pride in the Park. At Saturday’s event you will be able to get tested. There will be a workshop on PrEP, a pill someone can take once a day that will help prevent HIV infection, and on men’s sexual health, which will touch on the high rates of HIV cases in the Valley. Pride in the Park will also include the La Frontera Queer Film Festival, a first for the event. Fourteen films — full length, short and documentaries — will be shown throughout the event. One of the films, “POSI+IVE,” is from Australia and follows a young man as he comes to terms with his HIV diagnosis. The organizers received 80 film submissions, Colon-Uvalles said. This year’s event moves indoor to beat the heat and will include musical performances, vendors, a drag show and activities. Mariah Paris Balenciaga, a Season 3 “RuPaul’s Drag Race” contestant, will make an appearance. Local businesses, organizations, medical providers and agencies will be present so the public knows what resources serve the LGBTQ community. Pride in the Park will also include a special appearance by labor leader and civil rights activist Dolores Huerta. Follow the Pride in The Park Facebook page for more information. Scheduled performers include Apache Pistol, Aerotek, Caldo Frio, Patrick Boothe, Fantastico, the all-female mariach band Las Coronelas and DJ Bella. WHEN 3 to 10 p.m.